The Hazard family settled in Rhode Island in 1639 in towns surrounding what is known today as Portsmouth, RI. The next few generations of the family moved across the bay into South Kingstown where they owned large plantations with sheep. In 1799 the Hazard’s home weaving moved from farmhouse to mill when Rowland Hazard purchased half interest in the Peace Dale mill from Benjamin Rodman. His involvement in the business grew and by 1812 he had purchased the mill privilege outright. He invested money in machinery including primitive water power looms for carding wool and by 1815 he ran a small fully operated manufacturing operation that is said to be one of the first such textile plants in America. In 1819, his sons Isaac Peace Hazard and Rowland G. Hazard took over mill operations. The purchase of this mill was the beginning of the Hazard family empire, which dominated village life for more than a century. In 1823, Peace Dale had about 30 inhabitants and was growing slowly. In the mid 1840’s the original mill burned down and was replaced by a building made out of a fireproof stone with additions added in the following years. In 1848 the Peace Dale Manufacturing Company was incorporated and led by Isaac and Rowland G. who installed a power spinning jack and began manufacturing kersey cloth and linsey-woolsey. This was a major turning point for the small village of Peace Dale. In 1858, many new buildings began to be erected due to Rowland G. Hazard’s funding and design. 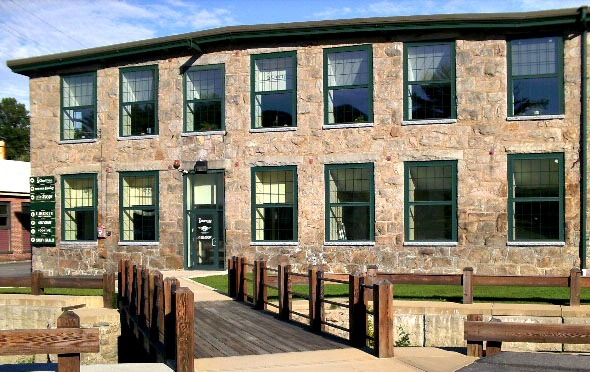 The smaller buildings were used for many mill activities including wool storage, a workers’ dining room, even a chemical laboratory. The additional buildings also included a meeting house, a church, and most importantly an office building which included a post office, a village store, and a mill workers’quarters. Over the next several decades Rowland G. Hazard influenced the construction and design of numerous additional buildings, accounting for more than half of what is built today in Peace Dale. During the Civil War, the mill had a contract to make 50,000 army blankets. President Lincoln received one of the Peace Dale shawls. After the war, a new 3-story weaving building was constructed that covered a half acre. In this building they manufactured serge* and cheviots**. Peace Dale cloth won first prize at the Centennial Exhibition in Philadelphia. Its serges won first prize at the Chicago World’s Fair, as well as a gold medal in Paris in 1901. By 1900 the Peace Dale population was 1500 and 40% of that population worked in the mill. During World War I, women asked the mill to make knitting yarn so they could knit items for the soldiers. The mill manufactured khaki colored cloth for the army as well. One thousand workers were said to be employed in the mill during WWI. In 1918, Rowland Hazard III, son of Rowland G. Hazard, sold the mill to M.T. Stevens and Sons who operated it until 1947. The two-story stone facade and bell tower are all that remain of the stone mill built by the Hazards in the mid-1840’s. Interesting fact about Rowland Hazard III: Rowland Hazard III struggled with alcoholism, which led to his direct involvement in what is today Alcoholics Anonymous (AA). His own efforts at recovery were markedly influenced by his consultation with psychologist Carl Jung. * Serge is a type of twill fabric that has diagonal lines or ridges on both sides, made with a two-up, two-down weave. The worsted variety is used in making military uniforms, suits, great coats and trench coats. ** Cheviot, woollen fabric made originally from the wool of Cheviot sheep and now also made from other types of wool or from blends of wool and man-made fibers in plain or various twill weaves.